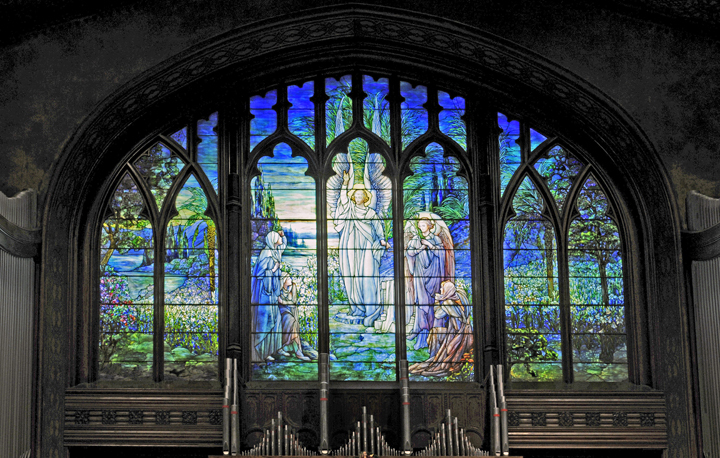 This monumental seven-lancet chancel window at First United Methodist Church of Grand Rapids represents the resurrection of Jesus after his crucifixion, as related in the Book of Luke. Three women have come in the early morning hours to the tomb where he was laid, intending to anoint his body with spices and oils. They are met by two angels who tell them that Jesus is no longer there because he has risen from the dead. The central figures of the women and angels are placed against a luxuriant landscape filled with lilies, trees and water that reflects the colors of the rising sun. 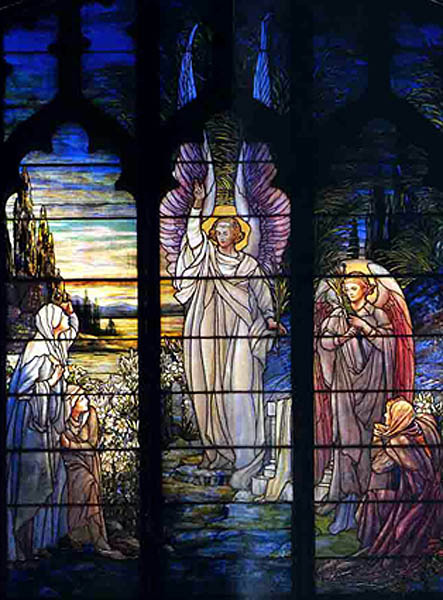 The fourteen by twenty-six-foot window was created by the Tiffany Studios of New York and unveiled at the Christmas Eve service in 1916. It was given to the church by Edward Lowe in memory of his mother, Eliza Ellen Lowe. First United Methodist Church of Grand Rapids was organized in 1835 by early settlers in the Grand Valley area. Their first wooden structure of 1840 was replaced by three successive church homes. The present limestone building, completed in 1916, was designed in a modified Tudor Gothic style by Robinson and Campau, a noted Grand Rapids architectural firm. William Holt assisted with the design of the interior. Other windows in the church and its chapel include several created by the Willet Stained Glass Studios of Philadelphia. First United Methodist Church was registered in the Michigan Stained Glass Census by John O. Lockwood of Grand Rapids. Bratt, James D. and Christopher H. Meehan. Gathered at the River: Grand Rapids, Michigan, and its People of Faith. Grand Rapids, MI: Grand Rapids Area Council for the Humanities: William B. Eerdmans, 1993. First United Methodist Church, Reflections of Immortality. Grand Rapids, MI: First United Methodist Church, 1983. Luke 24: 1-9. The Holy Bible, King James Version. (New York: American Bible Society: 1999). Published May 2000 by Bartleby.com; © Copyright Bartleby.com, Inc. Text by Betty MacDowell, Michigan Stained Glass Census, April , 2006.